Under hot, hazy summer skies Thursday, the Jersey Shore’s newest fishing destination was born. Piece by piece, crews from Reicon Group, a marine construction company that usually undertakes massive development projects, spent their afternoon deploying 1,500 tons of concrete castings from a barge to the ocean floor. 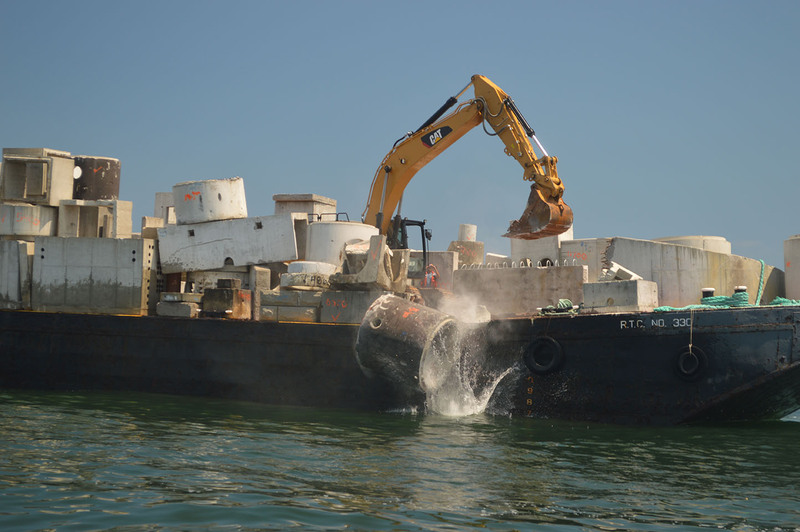 As a tug boat steadied the barge, a front loader pushed each piece of structure into the water, creating what will become both a habitat for marine life an a recreational angler’s paradise. The materials were donated by Garden State Precast, of Wall. 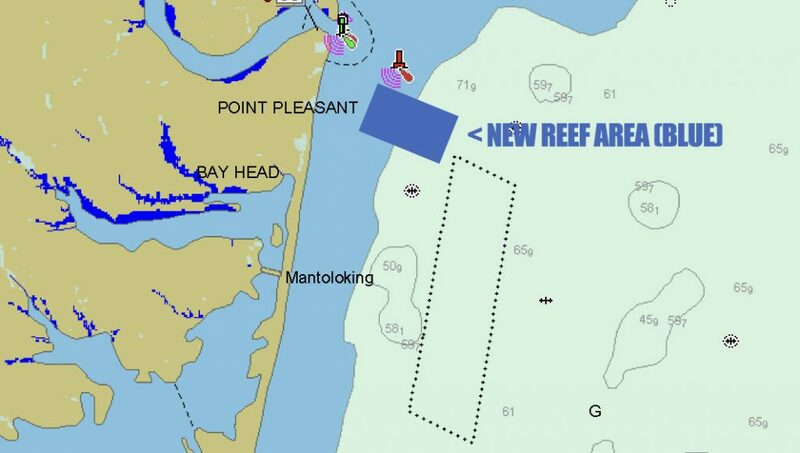 The Manasquan Inlet reef is just 1.2 miles east of the inlet, just beyond the red “sea buoy.” It will be off-limits to commercial fishermen, and the closest reef to inland waters, making the journey to sea under 10 minutes for anglers breaking the inlet. The creation of the reef is the culmination of a long and drawn-out political fight between recreational and commercial anglers. Recreational anglers have argued for years that a tax on fishing equipment and marine fuel help build reefs, only so they can lined with commercial pots, making them inaccessible to the average angler. In exchange for allowing commercial pots to remain on some reefs, the state agreed to build two new reefs which will be reserved for recreational anglers only. One of those is the Manasquan Inlet reef – the other will be located in Delaware Bay. Peter Clarke, a biologist with the state’s Bureau of Marine Fisheries, has led the state’s reef program for years. He was on hand Thursday for the deployment, said the site was chosen because of its easy accessibility for a large number of anglers. 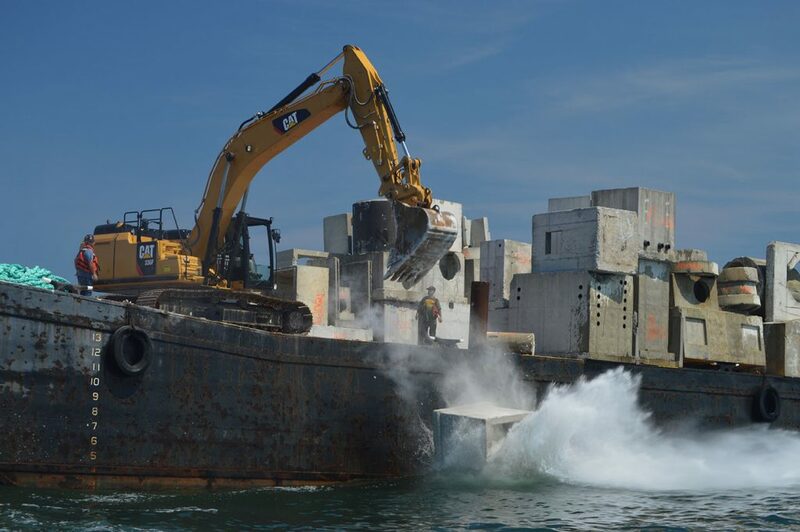 The 1,500 tons of concrete will make the reef especially popular for drift fishing, the primary method of catching summer flounder and black sea bass from boats. Other reefs are designed with structure to which boats can anchor to catch other species. The Manasquan Inlet reef is located between two other reefs – the Sea Girt and Axel Carlson reefs. While smaller in area, the new reef will likely become very popular, and the concrete castings are just the beginning of what will be sunk there. 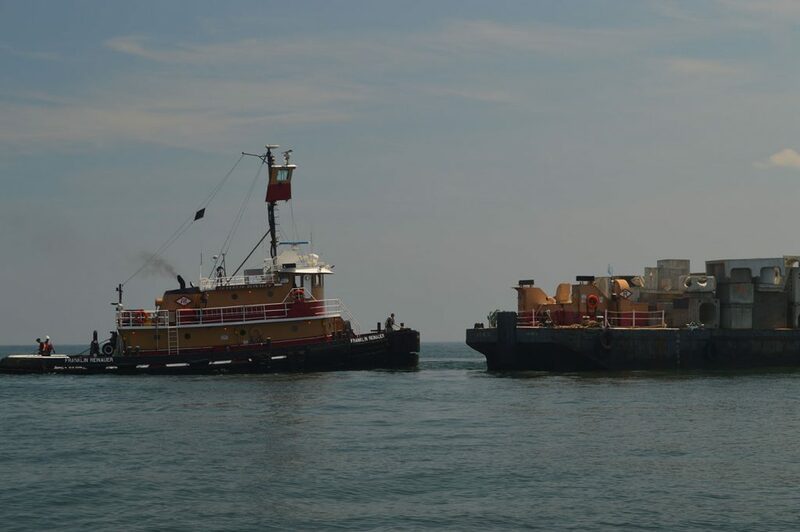 In August, crews will begin deploying material from the former bridge that connects New Jersey and Staten Island. A new Goethals Bridge recently opened. “We also have a 92-foot fire tug boat,” Clarke said, which will be sunk as a memorial reef for first responders. Funding for the reef was also provided by the Great Point Pleasant Charter Boat Association, Ocean Reef Foundation and SportsFishingFund.org.